Promotes a more uniform skin. 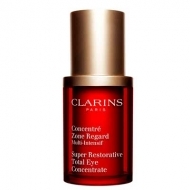 DESCRIPTION: Haute Exigence Nuit Multi-Intensive TP from Clarins is an anti-aging cream that provides intensive replacement for skin weakened by hormonal changes linked to aging. The unique and organic harungana extract, the tree of Madagascar that "cures", replenishes the skin at all levels while the Montpelier plant extract promotes a more even skin tone. Night after night, skin is visibly lifted, nourished, moisturized and unified for a radiant look in the morning. Apply every night on clean skin of the face and neck, with pressing light movements from the face of the center out. To maximize results first apply a serum.